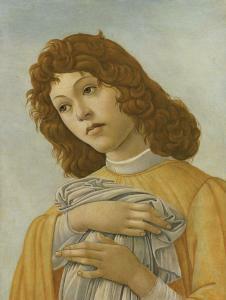 Find artworks, auction results, sale prices and pictures of Sandro Botticelli at auctions worldwide. painted surface: 16 by 12 1/8 in. ; 40.6 by 30.8 cm. diameter: 33 in. ; 83.3 cm. 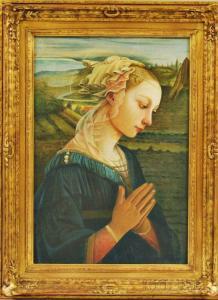 By whose estate sold, New York, Christie's, 28 January 2009, lot 8 (as Studio of Botticelli). Possibly F. Bocchi, T. Frangenberg and R. Williams (eds. ), The Beauties of the Cities of Florence, A Guidebook of 1591, London 2006, pp. 173-174 (as Botticelli). This elegant Madonna and Child with Saint John the Baptist and an Angel is likely identifiable as the lost painting noted in the Florentine collection of Baccio Valori by Francesco Bocchi in 1591 (see Provenance and Literature). 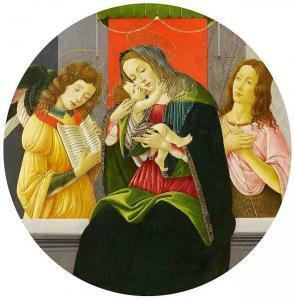 Bocchi describes the painting as, "Tondo molto grande, doue di mano di Sandro Botticelli è dipinta vna Madonna, che ha il puttino in collo di leggiardo colorito. È di aria nobile la Vergine, & il figliuolo altresi: & due Angeli in graziosa vista, & lieta sono di vero bellissimi, & molto rari. 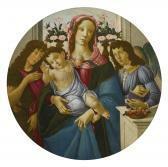 Due vasi di rose, le quali mostrano mirabil freschezza, accendono fi letizia chi mira, & il colorito nel tutto vago rende questa pittura nobile & rara" ("a very large tondo by Sandro Botticelli, in which is painted, with lovely coloring, a Madonna with the Child in her arms. The Virgin has an air of nobility and so does the Child: the two angels of graceful and joyous countenance, are truly most beautiful and fine. Two vases filled with roses, which seem to be wonderfully fresh, galdden whoever looks at them, and the coloring, lovely throughout, makes this picture distinguished and precious."). Viewing the painting under Infrared (fig. 1) reveals changes in the underdrawing. This is evidence that, rather simply than following a cartoon, the artist was thinking and evolving the the composition as he painted. The position of Saint John the Baptist's head has shifted slightly from the drawing to the finished painted version, the placement of the fingers on his right hand were altered, and the Christ Child's arm was moved marginally and more convincingly foreshortened. As Nicoletta Pons notes in her 1989 monograph of the artist (see Literature), this composition is loosely derived from Botticelli's Madonna of the Pomegranate, in the Galeria degli Uffizi, Florence (fig. 2). The Uffizi panel, also a tondo, dates to 1487 and depicts the Madonna in a similar pose, at the center of the composition, her head tilted to the right, her right hand deftly holding the Child in her lap. The Child, however, leans to the left side in that painting and the Madonna is accompanied by a host of angels, rather than an angel and Saint John the Baptist as in the present panel. 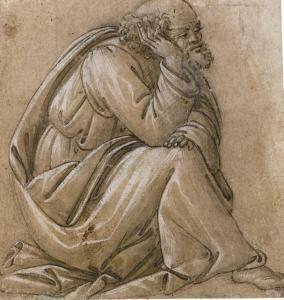 Another version of the present tondo can be found in the National Museum, Warsaw (inv. no. M.06.607) and formerly belonged to the Ingenheim family of Reisewitz. The Warsaw tondo follows the present composition, varying only objects on the ledge in the foreground to the right. The bowl of wild strawberries is instead replaced by a white leather-bound book and white cloth. A further version is in the Art Institute of Akron, Ohio and Ronald Lightbown cites a third, without referencing its location, known through photographic archives at the Villa I Tatti, Florence (see N. Pons and R. Lightbown under Literature). We are grateful to Laurence Kanter for endorsing the attribution and suggesting a dating to the 1490s on the basis of firsthand inspection. 1. Translation from F. Bocchi, 2006, under Literature. 2. N. Pons, under Literature, p. 74, cat. no. 69. 3. Ibid., p. 74, under cat. no. 72.
. Frame with a label from Newcomb-Macklin Co., Chicago, on the backing paper. Rabbet dimensions 22 3/16 x 15 1/4 in., outside dimensions 28 1/4 x 21 5/16 in. Condition: Minor wear to the patina. Laid down. Overall in quite good condition. Few nicks at the lower margin and right lower corner. Some rubbing top and bottom margins. Some slight oxidation of the white heighteneing. Slight surface dirt and a brown stain in the lower mid of the Saint Joseph mantle. A light brown stain to the left margin toward the upper corner. Sold mounted and framed in a old 16th or ealy 17th century Italian frame. "In response to your inquiry, we are pleased to provide you with a general report of the condition of the property described above. Since we are not professional conservators or restorers, we urge you to consult with a restorer or conservator of your choice who will be better able to provide a detailed, professional report. Prospective buyers should inspect each lot to satisfy themselves as to condition and must understand that any statement made by Sotheby's is merely a subjective, qualified opinion. Prospective buyers should also refer to any Important Notices regarding this sale, which are printed in the Sale Catalogue. NOTWITHSTANDING THIS REPORT OR ANY DISCUSSIONS CONCERNING A LOT, ALL LOTS ARE OFFERED AND SOLD AS IS" IN ACCORDANCE WITH THE CONDITIONS OF BUSINESS PRINTED IN THE SALE CATALOGUE."